Oprah Winfrey was born poor and black in Mississippi in 1954, when poor and black meant no flush toilets, no shoes, and no real chance to get ahead in the world. 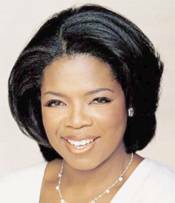 She was supposed to be "Orpah" Winfrey, named for the Biblical Ruth's sister-in-law (see Ruth, chapter 1), but the name was spelled wrong on her birth certificate, and soon everyone was calling her Oprah. She learned to read at home, and skipped kindergarten to go straight into first grade. She skipped second grade, too. At 17 she was working as a reporter for a local radio station. She was a bright kid. And beautiful -- at 18, Winfrey won the Miss Black Tennessee beauty pageant. At 19, she was anchoring a newscast on Nashville's WTVF-TV. She later co-anchored the nightly newscast at WJZ-TV in Baltimore, and co-hosted a local talk show called People Are Talking, before jumping to Chicago's WLS-TV. Her morning talk show there debuted in 1984, and rose to number one in the ratings within a month. Outside of local telecasts, Oprah first drew national attention in her film debut, The Color Purple, for which she snagged an Oscar-nomination as best supporting actress. She's acted in other films since, but never nearly so well. Winfrey's talk show went national in 1986, and as it had in Chicago, Oprah took the top spot almost immediately. It's been the top-rated daytime talk show ever since. Winfrey's interview style is intimate, emotional, and seemingly sincere. It's been described as televised therapy, and diehard fans say she does more than merely entertain and interview, she helps her viewers deal with life. Others are immune to Winfrey's powers, but the pro-Winfrey crowd can point to her dozens of Emmy awards. Winfrey has spoken of being sexually abused as a child, and stated publicly that she'll never have children of her own. She testified before Congress in support of "The Oprah Bill", establishing a national database of convicted child abusers. Lyman: 100,000 cows per year in the United States are fine at night, dead in the morning. The majority of those cows are rounded up, ground up, fed back to other cows. If only one of them has Mad Cow Disease, [it] has the potential to affect thousands. Remember today, [in] the United States, 14% of all cows by volume are ground up, turned into feed, and fed back to other animals. Winfrey: But cows are herbivores, they shouldn't be eating other cows. Winfrey (to audience): Now, doesn't that concern you all a little bit, right here, hearing that? It has just stopped me cold from eating another burger! As soon as the episode aired, beef prices dropped to their lowest point in years, and Winfrey was later sued under obviously un-constitutional laws forbidding criticism of food products without scientific evidence. Winfrey moved her entire show to Amarillo, Texas, for the duration of the trial. And she won. The court wrote that "Lyman's opinions, though strongly stated, were based on truthful, established fact, and are not actionable under the First Amendment". Titles recommended by Oprah's Book Club were immediate best-sellers, so it was startling in 2001 when Jonathan Franzen, author of The Corrections, got Oprah's honor and didn't jump for joy. "She's picked some good books", Franzen said, "but she's picked enough schmaltzy, one-dimensional ones that I cringe, myself, even though I think she's really smart and she's really fighting the good fight." Winfrey decided Franzen's book wasn't book club material after all, withdrew her offer, and eventually suspended the book club. In June 2003, the book club re-emerged with a different tactic: instead of making overnight successes out of contemporary authors, Oprah would encourage people to read classics. Recent selections include East of Eden by John Steinbeck, Cry, The Beloved Country by Alan Paton, One Hundred Years of Solitude by Gabriel Garc�a M�rquez, The Heart Is a Lonely Hunter by Carson McCullers, and Anna Karenina by Leo Tolstoy. In September 2005, she returned to contemporary literature with James Frey's embellished addiction memoir A Million Little Pieces. She is the first black American woman billionaire -- net worth $2.4B (Forbes 2010) -- and reportedly makes about half a million dollars a day from her TV show alone. She owns or co-owns the Oxygen Network, O Magazine, her own Harpo Studio, Harpo Productions, Harpo Films, Harpo Print, Harpo Video, and the Oprah Winfrey Network. Harpo, of course, is Oprah spelled backwards.